Compiled by British Intelligence, for restricted official issue by the General Staff, German Army Handbook of April 1918, is a comprehensive assessment of the German Army during the latter stages of the First World War. Illustrated throughout with plates, diagrams, charts, tables and maps, it provides a detailed breakdown of the army, covering all aspects from recruiting and training, mobilization, command and organization, weapons and signals to transportation, medical and veterinary services, and uniform. The German Army Handbook of 1918 was a remarkable achievement. It provides solutions to many questions that histories of the First World War and accounts of its battles are unable to answer. It shows how the static conventions of trench warfare usurped the traditional role of cavalry, and how the German Army were able to take advantage of the dominance of the machine-gun on the Western Front in 1915. There are also two maps, showing Army Corps Districts, and Zones of Administration and Lines of Command in June 1917. 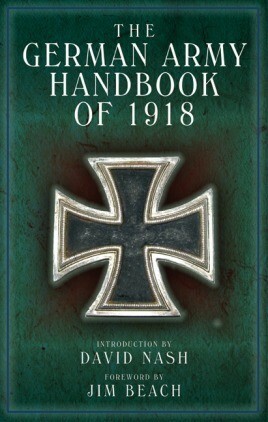 The events of 1914 transformed the armies of Europe, and made much of the information contained in the amended 1912 handbook worthless. The emergence of trench warfare created conditions in which the traditional concepts of offense and defense had little meaning. Within a few months battle conditions had created a situation in which pre-war intelligence publications had only little relevance. David Nash is an author and historian.